a small, spherical to rod-shaped, membrane-bounded cytoplasmic organelle, the principal sites of ATP synthesis; mitochondria also contain enzymes of the citric acid cycle and ones for fatty acid oxidation, oxidative phosphorylation, and other biochemical pathways. They also contain DNA, RNA, and ribosomes; they replicate independently and synthesize some of their own proteins. adj., adj mitochon´drial. Mitochondrion. This organelle has a double membrane that unfolds and forms cristae. The membrane and cristae serve as attachment sites for oxidative enzymes. From Damjanov, 2000. An organelle of the cell cytoplasm consisting of two sets of membranes, a smooth continuous outer coat and an inner membrane arranged in tubules or more often in folds that form platelike double membranes called cristae; mitochondria are the principal energy source of the cell and contain the cytochrome enzymes of terminal electron transport and the enzymes of the citric acid cycle, fatty acid oxidation, and oxidative phosphorylation. A spherical or elongated organelle in the cytoplasm of nearly all eukaryotic cells, containing genetic material and many enzymes important for cell metabolism, including those responsible for the conversion of food to usable energy. a rodlike, threadlike, or granular organelle that functions in aerobic respiration and occurs in varying numbers in all eukaryotic cells except mature erythrocytes. 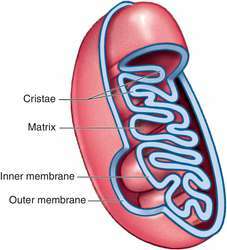 It is bounded by two sets of membranes, a smooth outer one and an inner one that is arranged in folds, or cristae, that extend into the interior of the mitochondrion, called the matrix. Mitochondria provide the principal source of cellular energy through oxidative phosphorylation and adenosine triphosphate (ATP) synthesis. They also contain the enzymes involved with electron transport and the citric acid and fatty acid cycles. Mitochondria are self-replicating and contain their own DNA, RNA polymerase, transfer RNA, and ribosomes. Also called chondriosome. mitochondrial, adj. An organelle of the cell cytoplasm consisting of two sets of membranes, a smooth continuous outer coat and an inner membrane arranged in tubules or moreoften in folds that form platelike double membranes called cristae; mitochondria are the principal energy source of the cell and contain the cytochrome enzymes of terminal electron transport and the enzymes of the citric acid cycle, fatty acid oxidation, and oxidative phosphorylation. (pl. 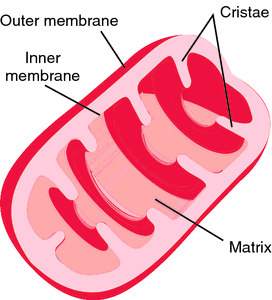 mitochondria) a subcellular, cylindrical organelle found in EUKARYOTES, of about 0.2–0.5 μm in length. Under the ELECTRON MICROSCOPE, the mitochondrion is seen to consist of a double membrane surrounding a matrix, with the inner membrane folded into projections called CRISTAE. The walls of the cristae are the site of ELECTRON TRANSPORT SYSTEMS producing ATP, while the reactions of the KREBS CYCLE take place within the matrix. Mitochondria have thus been named the ‘powerhouses’ of the cell and are especially prevalent in cells with a high energy requirement. Mitochondria are selfreplicating and contain DNA by which they can control the synthesis of some of their own proteins. Altmann anilin-acid fuchsin stain - a mixture of picric acid, anilin, and acid fuchsin which stains mitochondria crimson against a yellow background. Altmann fixative - a bichromate-osmic acid fixative. Altmann-Gersh method - the method of rapidly freezing a tissue and dehydrating it in a vacuum. Altmann theory - a theory that protoplasm consists of granular particles that are clustered and enclosed in indifferent matter. An organelle in the cytoplasm of cells, which produces most of the energy-rich molecule adenosine triphosphate (ATP) in cells. It is produced by using oxygen to break down nutrient molecules (e.g. glucose). The number of mitochondria in a cell varies, it is greater in active cells, such as muscle and liver cells which need more ATP. Mitochondria are involved in other processes (e.g. apoptosis, cellular proliferation). Each mitochondrion contains DNA, RNA, ribosomes and granules. The DNA is distinct from that of the cell nucleus. Mitochondrial DNA is inherited only through the female. Mutations in mitochondrial DNA causes genetic disorders (e.g. Leber's hereditary optic atrophy). Plural: mitochondria. The proteins produced by the mitochondrion function only in complexes with proteins produced by the nucleus and never in isolation (e.
Is it possible that the symbiosis that gave rise to the mitochondrion was also the impetus for the development of the nuclear membrane, the defining characteristic of the eukaryote? A ValRS phylogeny rooted with isoleucyl-tRNA synthetases (IleRS) showed that eukaryotic ValRS sequences form a monophyletic clade that is close to gram-negative bacteria, suggesting that the gene coding for this protein has been transferred from the ancestral mitochondrion (20). That shift would have set the endosymbiont on the road to becoming a mitochondrion and enabled its previously anaerobic host to become an aerobic creature. The hydrogen hypothesis: how did complex cells get their power stations? The program attempted to make the templates match structures in the picture without resorting to transformations that had been assigned a very low probability, When a match occurred, the savant designated the structure a probable mitochondrion. Brain warping: will electronic idiot savants become a doctor's best friends? From the video images, the scientists conclude that each vesicle and mitochondrion must have more than one attachment site, because they can switch from one filament to another nearby.